La FoodTech presents innovation from the entire French agri-food value chain. Come and meet about twenty startups in La FoodTech area. As part of French Tech, LA FOODTECH is an ecosystem that brings together entrepreneurs, industrial players, researchers, training players and public sector, at the mingling of the digital sector with agriculture, agri-food, food distribution and consumer goods. FOODTECH's ambition is to build a system for hosting, attracting and accelerating FoodTech projects that will spread France and its entrepreneurs influence. With its partners INRA, Les Mousquetaires, Groupe SEB and Orange, FOODTECH offers the opportunity to startups from the entire agri-food value chain, to disclose their innovative projects to French and international visitors. La Mère Mimosa, first handmade and 100% organic granola brand offers a premium range of 6 granola recipes. La Brigade des Epices creates unbeatable spices, natural sauce and other dressings. Ïhou offers gourmet insect-based products. The insects are 100% edible and farmed in France. Applifarm is the first platform to exchange, promote and track farming data. Carrés Futés is a range of vegetable cubes to cook, 100% natural: lots of vegetables and a bit of cocoa butter. La BOULE and CŒUR DE BOULE, 100% natural and gourmet snacks, without anything weird inside (preservatives, additives, added sugars…). Le Chef en Box is a pastry box: a recipe a month, with its technical sheet, the ingredients and the tools to make it! Frigo Magic, the no-waste app which offers recipes from your kitchen ingredients. Wynd is an omnichannel management platform, designed to create and manage all of your sales channels (order management, payment, …) in-store and out-of-store..
Foodle is the culinary assistant that adapts to your taste, your devices and the time you’ve got: no-stress cooking, 100% pleasure. Matahi offers a range of organic fruit juice made of baobab superfruit. Matatie exclusively produces cakes for kids, without the 14 mandatory reportable allergens. The Natâma range by Clarelia is an expert in meals without allergens, gluten and lactose. Nyséos is an expert in wine and beverage aromas. It provides innovative and analytical solutions. SensoStat is specialized in Sensory Analysis and mainly works with the Production, Quality, R&D, and Marketing departments. Edible eco-responsible cups for coffee time. TimeSens is a software devoted to the acquisition and statistical analysis of sensory data. STLO is the milk and egg Science & Technology laboratory. It is a research unit. The Centre for Taste and Feeding Behavior studies sensory perception of food, eating behavior and health consequences. «Optimized Food Products for Elderly Populations» defines and proposes vegetable and fruit-based food that improve nutrition and eating pleasure for elderly populations. MACEO is a brand of smart tableware that offers a disruptive innovation in the traditional tableware sector. Preditox supports its clients in evaluating the genotoxic and potentially carcinogenic properties of their compounds. Cooking Recipe Services is an open platform, developed by Groupe Seb and Orange to manage the recipe life cycle, from collection to publication. La Popote Minute, first La Popote Compagnie recreation nutrition range: good food & clean label products, created with children. Black garlic made with white garlic from Drôme. Meet La FoodTech in the Hall 6 gallery. INRA: Today, transitions in agriculture, food, ecology or energy are necessary to enable our societies to live better and in a sustainable way. Unique research organization in the world, INRA supports transitions and proposes disruptive innovations you can discover at SIAL in the FoodTech area. Les Mousquetaires: With more than 3,600 points of sale in Europe, Les Mousquetaires is one of the major players in the retail sector. Its unique positioning as "Producers & Traders", with an integrated agri-food division (62 production sites in France), has given it a strong innovation capacity since its creation. An innovative approach that it continues to develop today by facilitating collaboration with start-ups within all its entities. 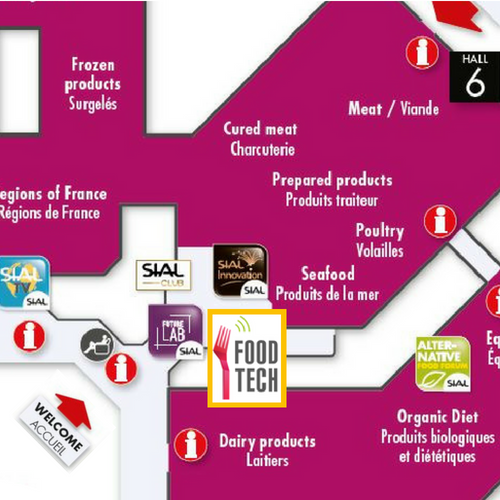 Meet them and discover these project in the FoodTech area at ​​SIAL. Seb: As the world leader in household appliances, Groupe SEB has put innovation at the heart of its strategy in order to provide consumers with novel concepts, disruptive products and new uses. In the FoodTech area at SIAL, with startups, SEB and Orange will present their initial work around the Cooking Recipe Services platform and Foodle service. Orange: Orange is one of the world’s leading telecommunications operators. The Group has a total customer base of 260 million customers worldwide at 30 June 2018, including 199 million mobile customers and 20 million fixed broadband customers. The Group is present in 28 countries. Orange is also a leading provider of global IT and telecommunication services to multinational companies, under the brand Orange Business Services. In March 2015, the Group presented its new strategic plan “Essentials2020” which places customer experience at the heart of its strategy with the aim of allowing them to benefit fully from the digital universe and the power of its new generation networks.